Dr. Sharda Jain .Secretary General of DGF welcomed all the members of the Central Committee meeting. All the members present were formally introduced. A. ELECTIONS: It was unanimously decided that the office bearers shall hold office for a maximum of 2 terms ( 4 years). They should Endeavour during their term to encourage and build second line of the team. B. All forums were requested once again to open up their accounts and make Life members. The money for other activities should be raised separate from membership fees. this was endorsed by all members of the committee. C. Directory – Dr. Sharda Jain / Dr, Jyoti Bhaskar appraised all that personal details are already uploaded on the website. Any correction if needed to be informed to us by SMS or whatsapp & each forum should cooperate,so that final outcome of directory is excellent. D. All forum office bearers were asked to communicate their schedule of activities at the start of the month. They were requested to send photos and short write up about the meeting to the central body or the website incharge. It would be preferable if the PPT can be uploaded. Female Foeticide before every meeting. Dr. Anita Sabharwal/ Dr. Susheela Gupta were given responsibility of making the pledge. 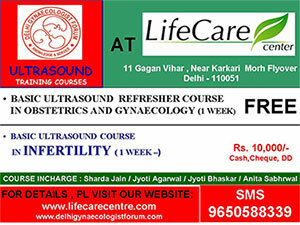 of AOGD will be held in central area of Delhi. The details shall be worked out soon and communicated. organize this on individual payment basis. for clinical practice. All forums should disseminate this information to all members. 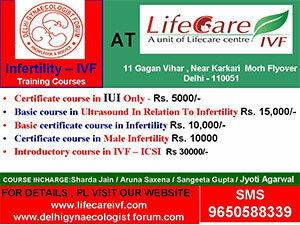 Centers who wish to give training to Doctors should contact Dr. Sharda Jain/ Dr. Sangeeta Gupta for ultrasound Training/ IVF & infertility training for DGF accreditation as a Training Centre.